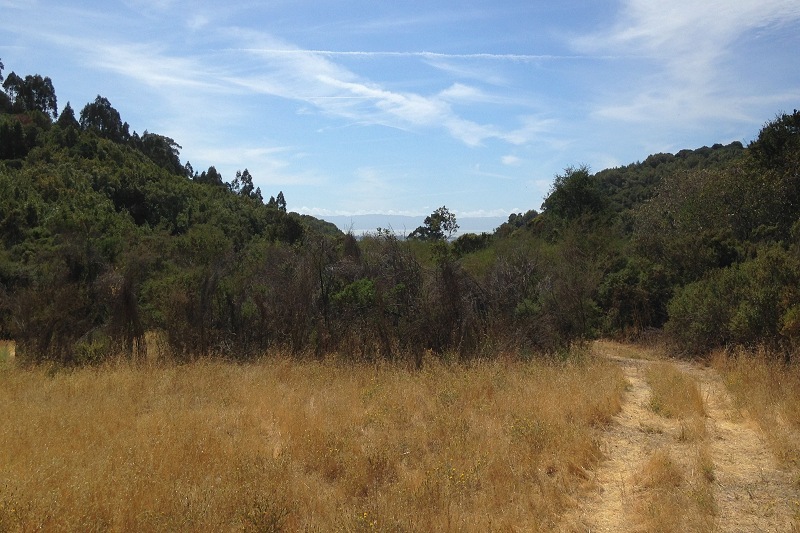 The most remote part of Oakland will be opened to public access fairly soon, when the East Bay Regional Parks District finally gets around to constructing a trail between Dunsmuir Ridge and Lake Chabot. I made my way into part of the route a few weeks back. 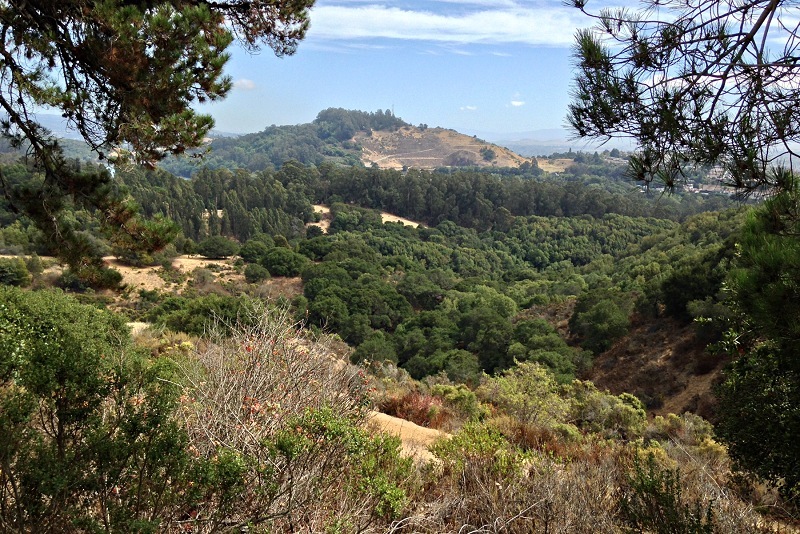 It’s interesting and inviting territory, set above an untouched oak-filled stream valley with Fairmont Ridge beyond. 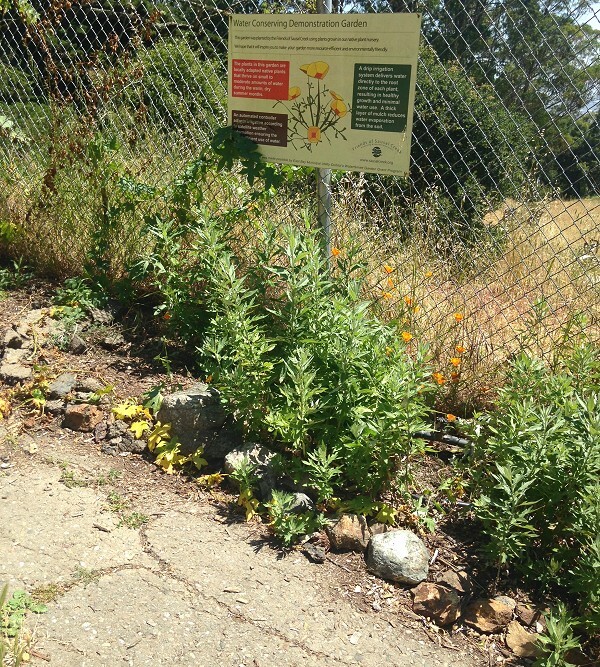 The land has divided ownership, with parcels belonging to the city, EBMUD and the East Bay Regional Parks District. They’re all public agencies, so the bureaucracy must have been difficult. 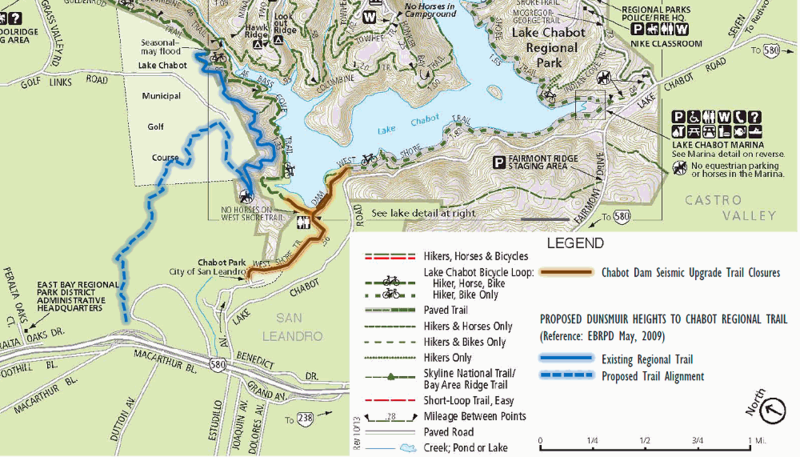 Here’s the setting, as laid out in a 2009 EBRPD map. 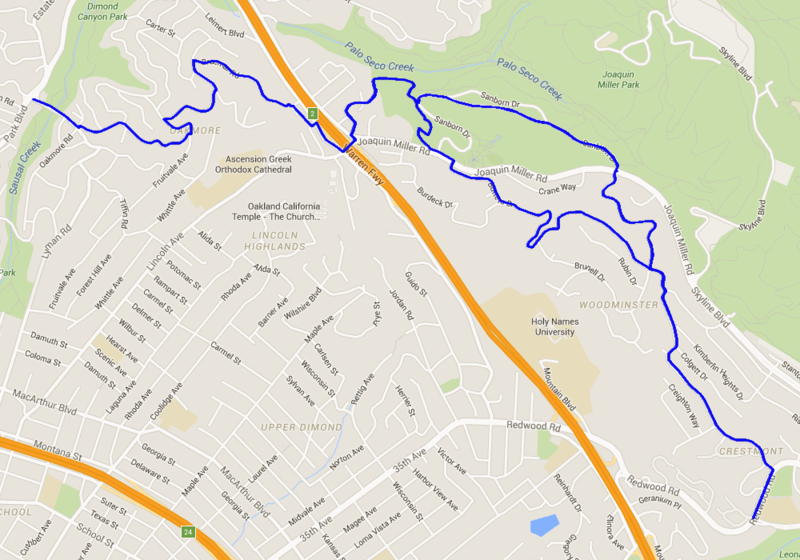 The solid blue line is a trail in Anthony Chabot Regional Park that’s been closed for years. 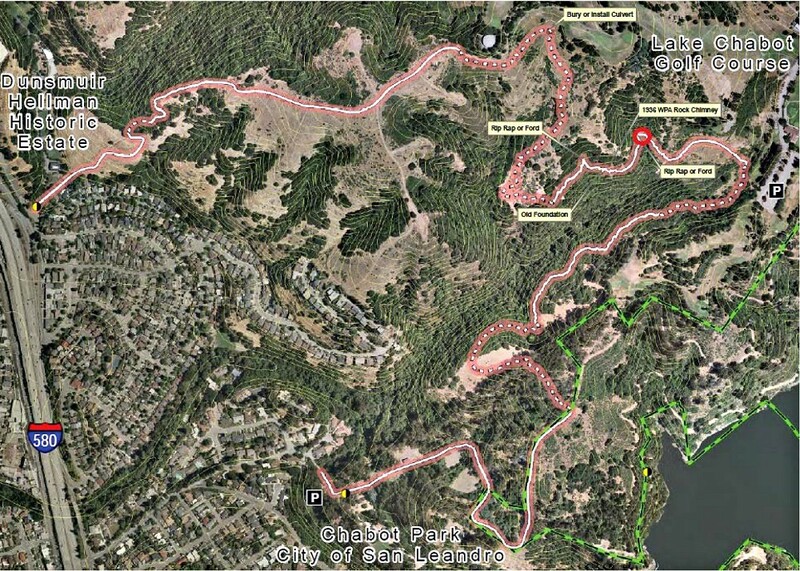 The dashed blue line is the proposed Dunsmuir Heights to Chabot Regional Trail. This summer the EBRPD board was shown this map of the approximate route. Again, the solid line is an existing (deteriorated) roadway and the dashed part will be built from scratch. 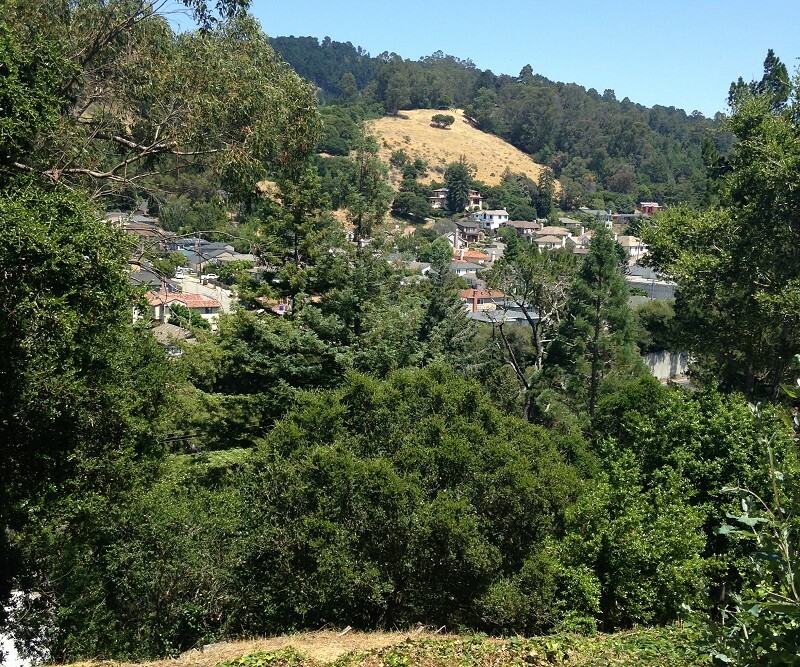 The photo at the top of this post is the view from the EBMUD water tank at top center. The part I’ll be showing is between there and the “P” mark at the city golf course. A couple more maps to help you see what’s here. First is the bare land as shown in Google Maps terrain view. The centerpiece of the trail’s route is the valley in the lower right quadrant. Note its depth and steepness. The permanent stream in that valley has no formal name, so I will hereby dub it Chabot Creek. 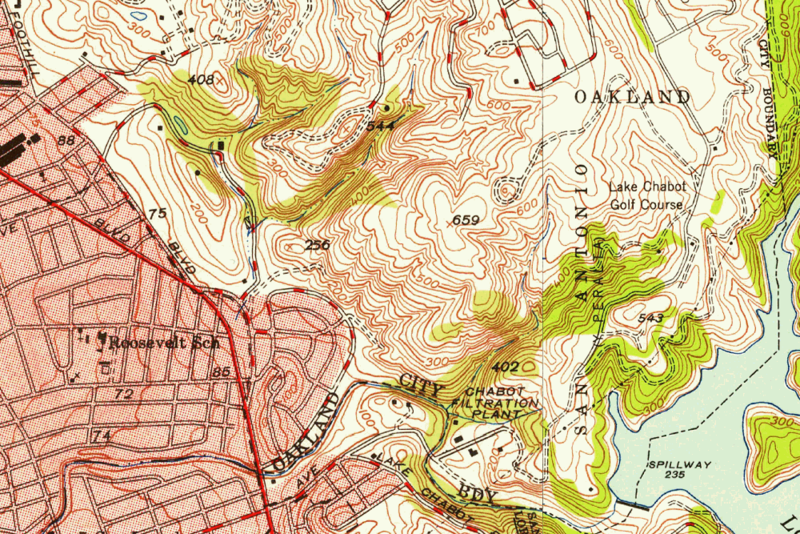 And finally here’s the same area in the 1947 topographic map, which shows the old roads that will become the trail. If you look at the upper part of Chabot Creek valley, you’ll see it turns sharply from southeast to southwest as you go downhill. On the Google map, though, the streamcourse is interrupted by a flat area. 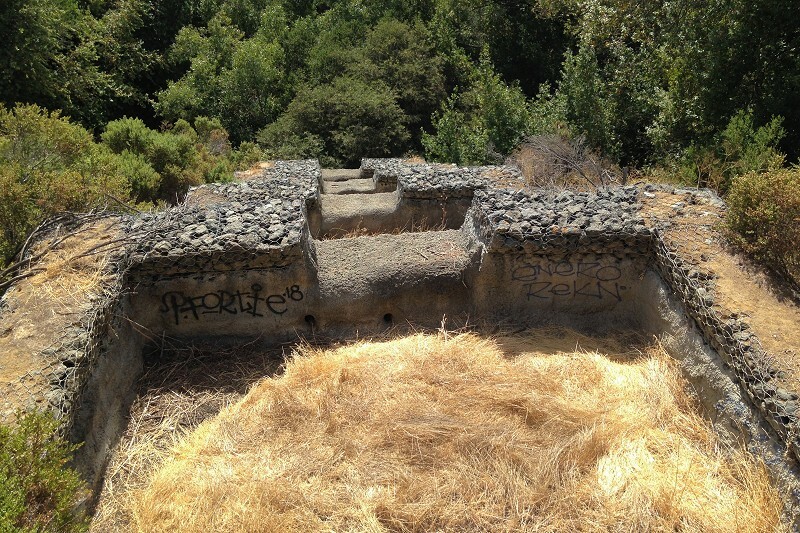 That’s landfill made of waste from the Cypress Viaduct, which collapsed in the 1989 earthquake. It’s sterile and weedy, but the view is nice. At its edge is a curious structure, visible in Google Earth, that turns out to be a spillway, made for the event of a large rainstorm during a very wet winter. 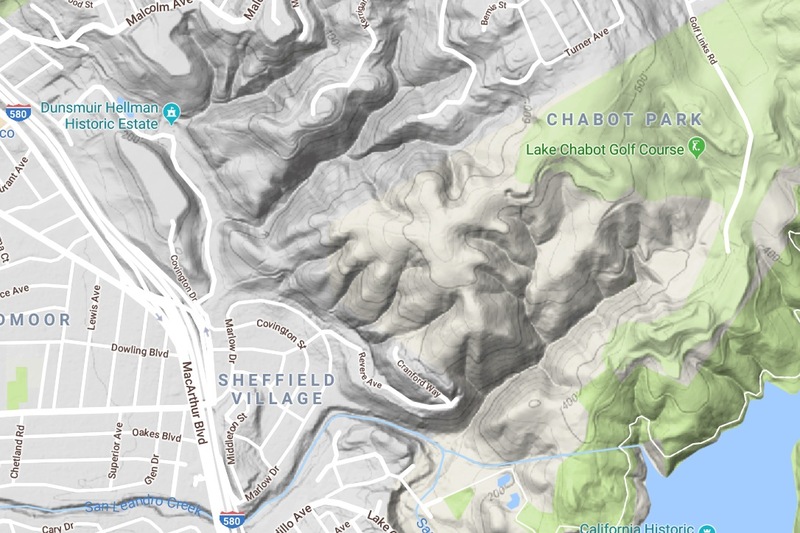 Presumably the landfill was capped with a layer of clay to stop any contaminants from leaching into Chabot Creek, and thus the site would fill with rainwater quickly and have a risk of spillover. 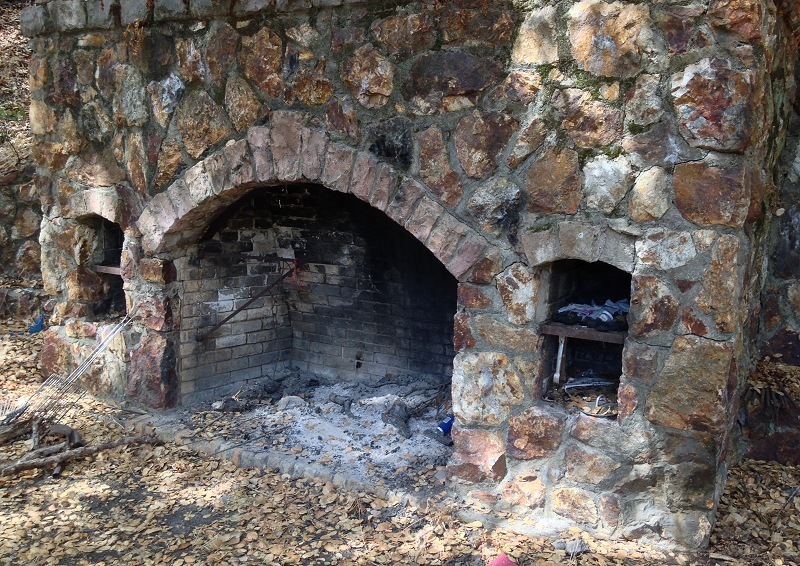 If you looked closely at the second map, you saw the intriguing pointers to an “old foundation” and a “1936 WPA rock chimney.” The chimney is a massive stone fireplace, suitable for a hunting lodge. But the building it once occupied is gone. Foundations around it show that it was a group facility of some kind. I’m hoping that local historians can say more about it in the comments. 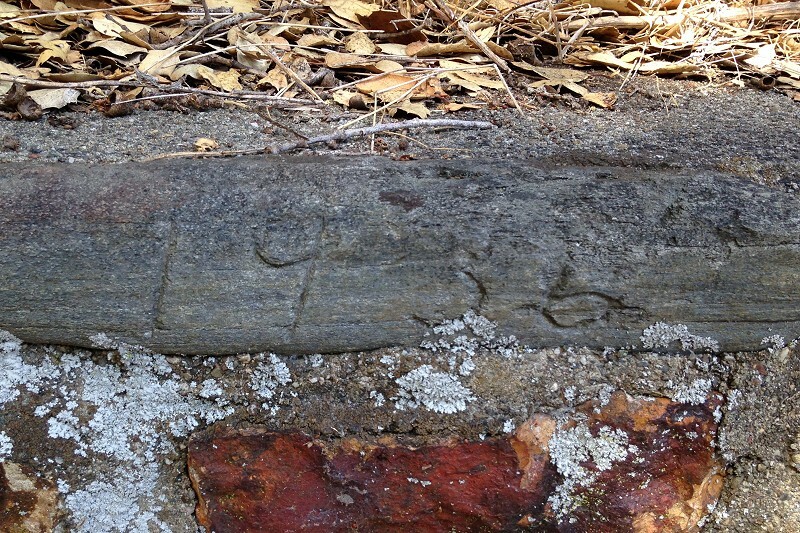 A stone in the entryway is carved with the date 1935, so the map is slightly in error. 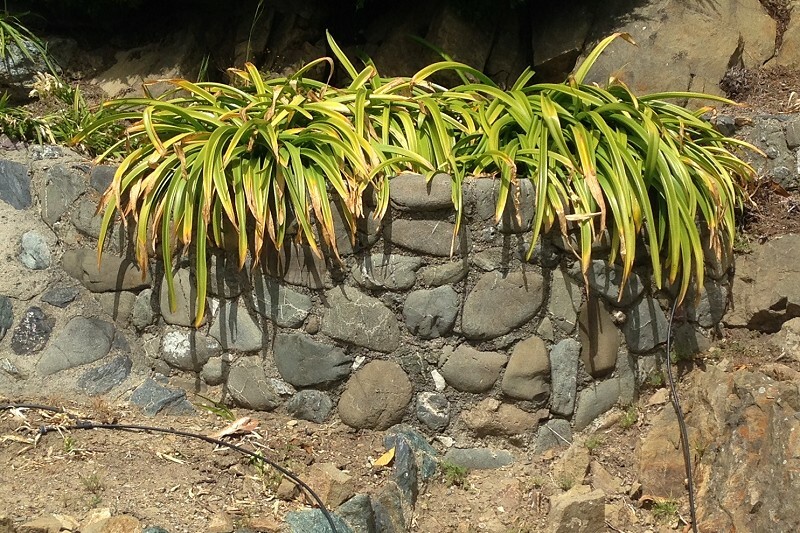 In any case, the stonework is indeed classic WPA masonry, of the same vintage, material and durability as the Woodminster Cascades in Joaquin Miller Park. 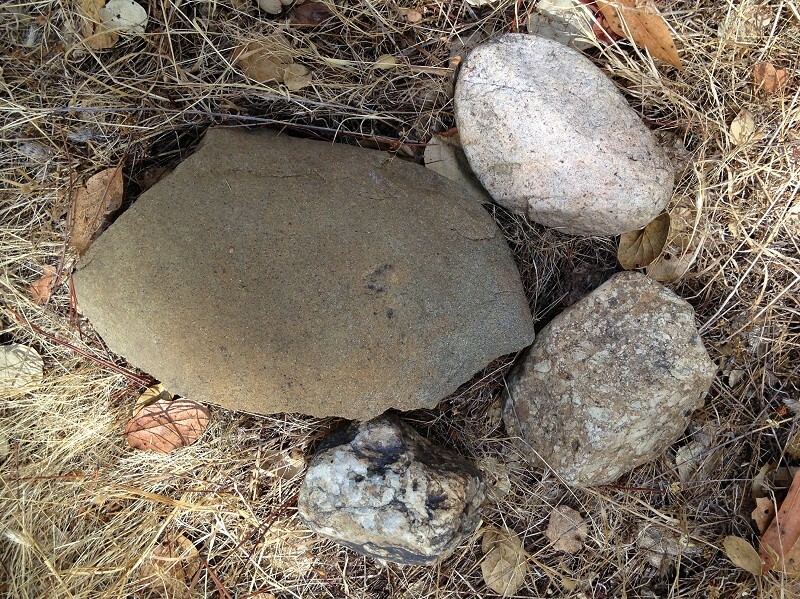 And speaking of stone, what are the rocks like around here, you ask. Here’s what’s mapped in the area. 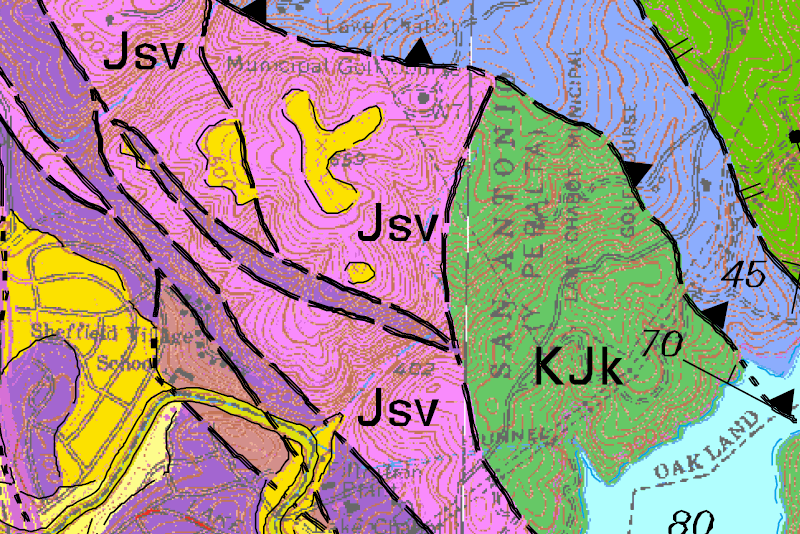 “Jsv” is the Leona volcanics, “KJk” is the sedimentary Knoxville Formation, and the blue field is Franciscan melange, the same body of rock underlying Knowland Park. 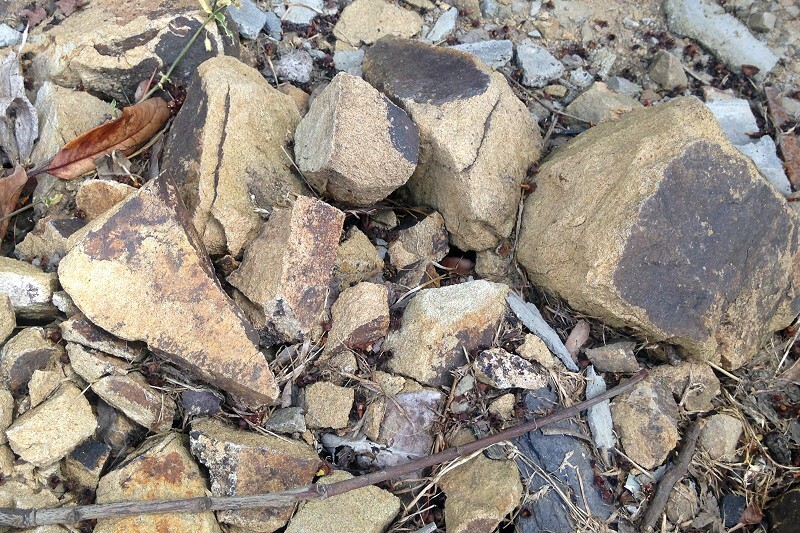 When I visited, I checked out a roadcut right where the Franciscan and Knoxville meet and found an assortment of rocks. All of these are appropriate for the Franciscan, but the brown sandstone could just as easily be from the Knoxville. A return visit is in order during the upcoming wet season, when the ground is firmer. 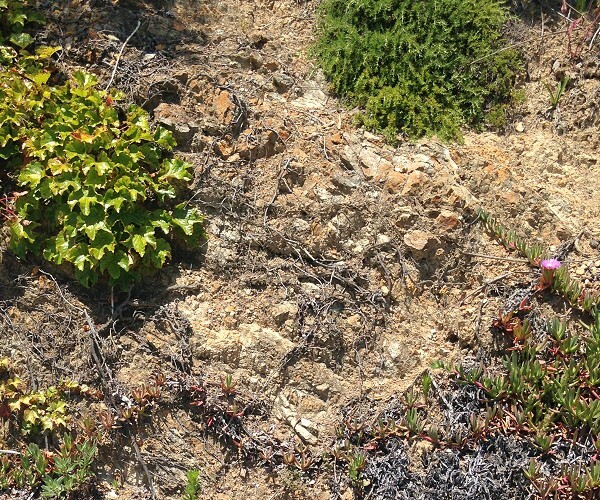 I hope to see more signs of the Franciscan “knockers” so well exposed in Knowland Park — and on the golf course, like this blueschist knocker cropping out in the rough. 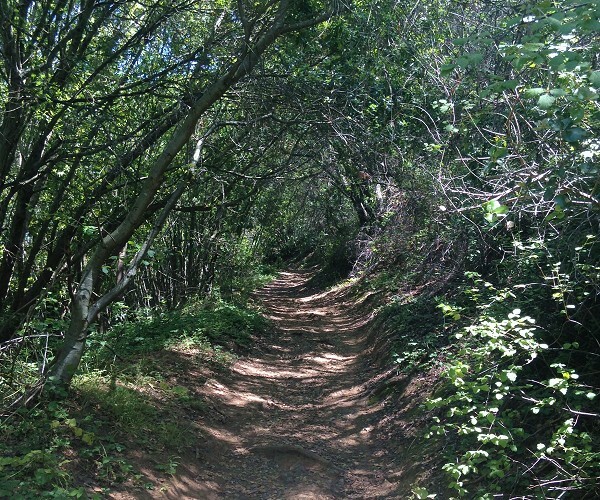 The plans for the Dunsmuir Heights to Chabot Trail are supposed to come up for public comment this fall, with the work to be completed by 2021. This house in Piedmont caught my eye not long ago. Homeowners who live in conspicuous places do their neighborhoods a service by making their properties shine. 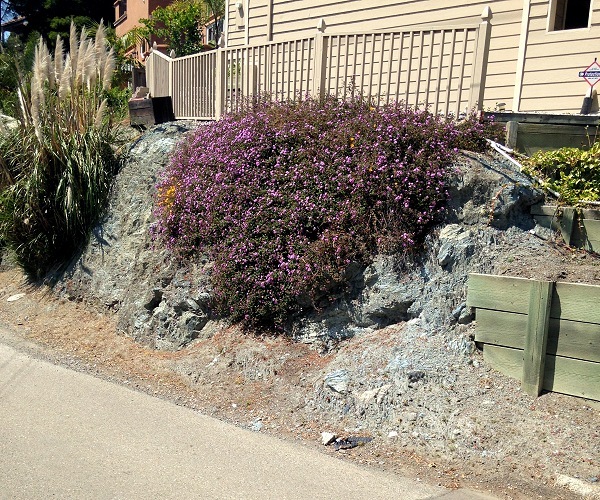 I appreciated the care the owners of this home displayed not just in their plantings, but also in their choice of rocks. 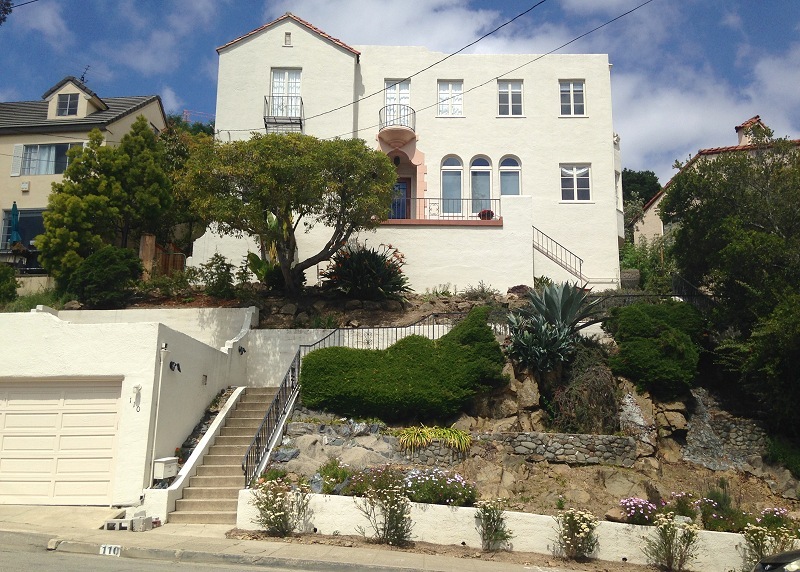 The site (110 Scenic Avenue) is in the middle of the block of Franciscan sandstone that underlies most of Piedmont and some adjacent parts of Oakland. The massive sandstone, of an unobtrusive tan color and undistinguished structure, makes a serviceable setting for some of the Franciscan’s other, more colorful rock types. 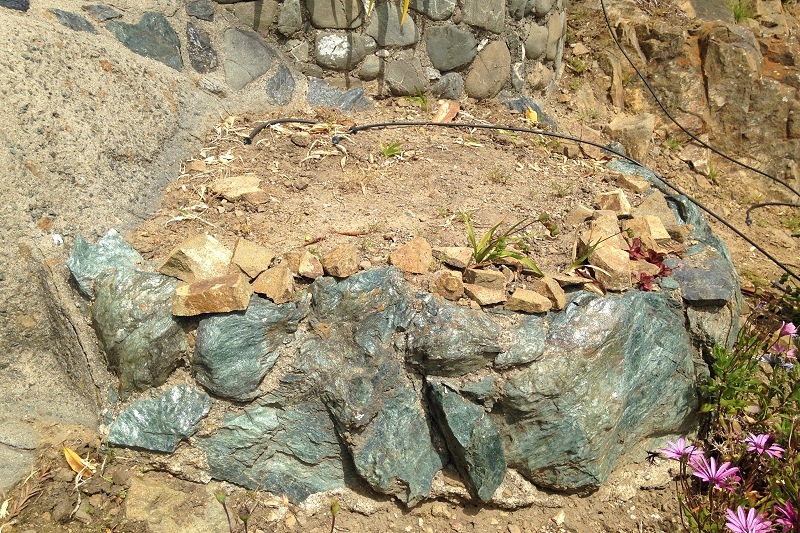 The exposure of bedrock is discreetly patched with concrete, which may well conceal rock bolts set into the hillside. 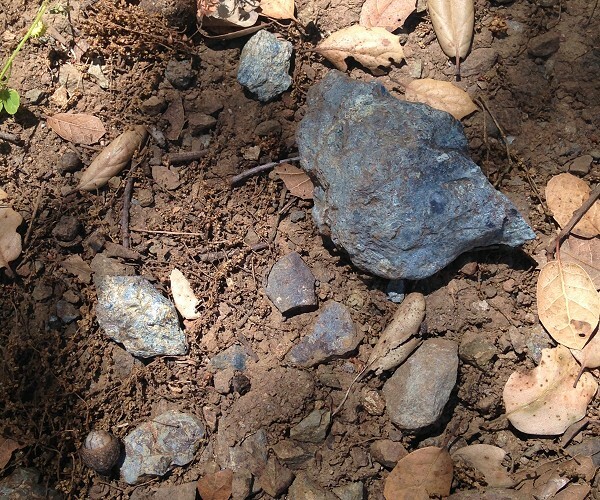 The section of concrete on the right side, below, is surfaced with the same blue serpentinite found at Elks Peak in Mountain View Cemetery, the old pit at Serpentine Prairie, around Butters Canyon, and elsewhere. There are several basins built onto the exposure. The bluish high-grade metamorphic river rock is carefully chosen, too. It comes from outside the Bay area, most likely somewhere on either flank of the Sacramento Valley. 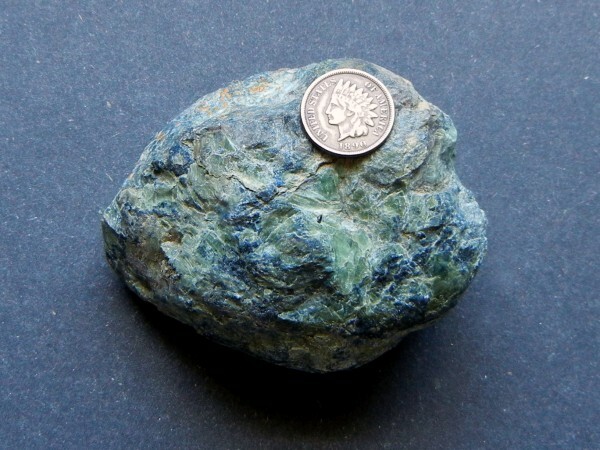 And just beneath it is this little jewel of high-grade blueschist. 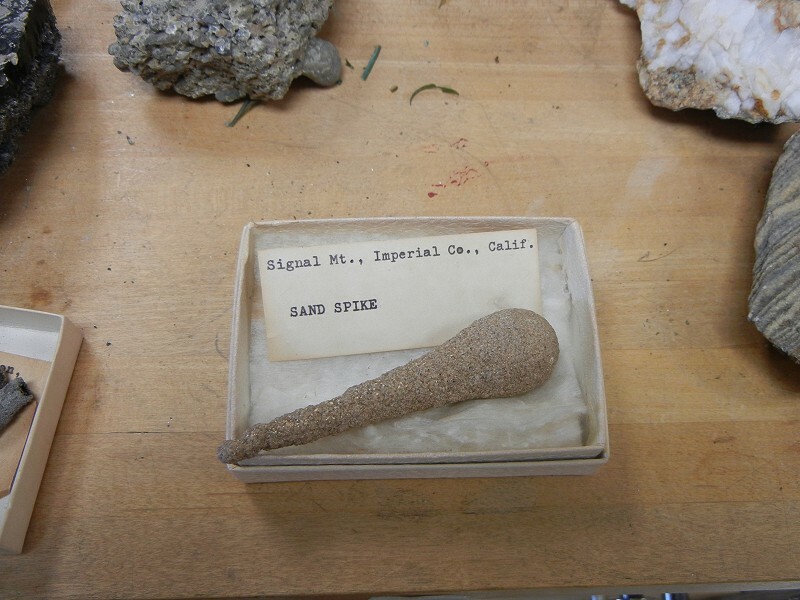 Of course a geologist’s first focus is on the stone. But the true beauty of a yard like this is how the rocks converse with the plants set among them over the course of a California year. I’ll be back to see that. 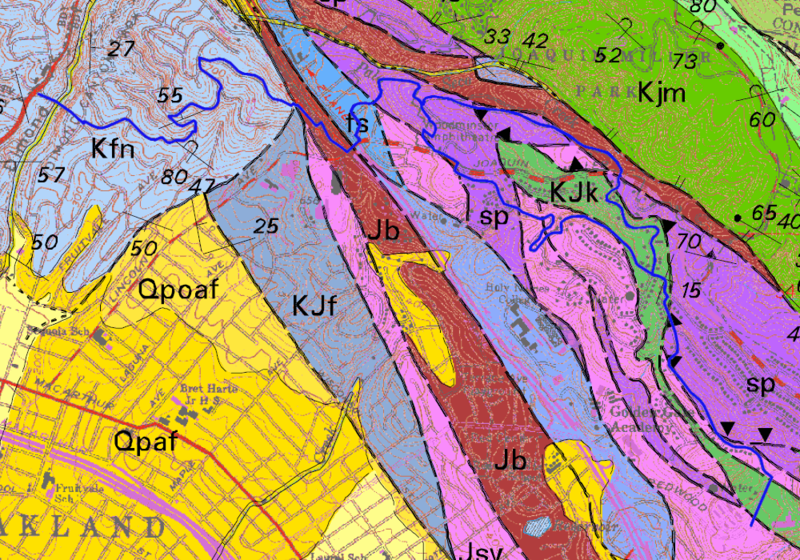 I keep saying that Oakland has geological features worthy of being put in textbooks. 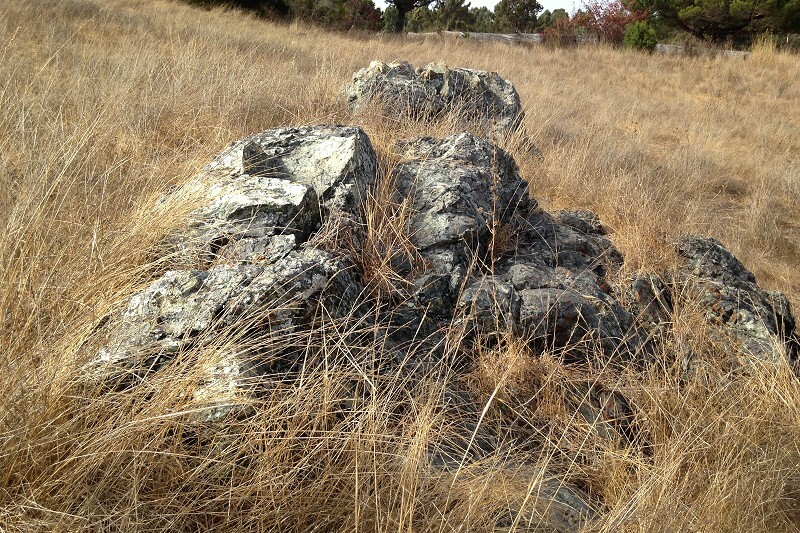 Today I’m here to show you that Oakland has rocks worthy of being in museums, and I’ve put them there. 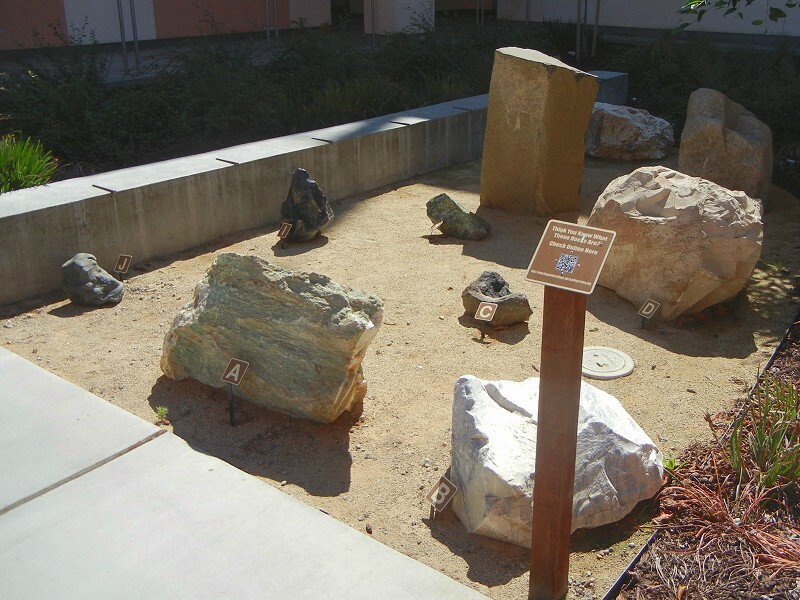 In 2012, I was asked to put together a set of teaching rocks for the Chabot Space and Science Center. After all, other planets are made of rocks, right? It took some doing, but some of the rocks were easily available within Oakland’s borders in roadside exposures. 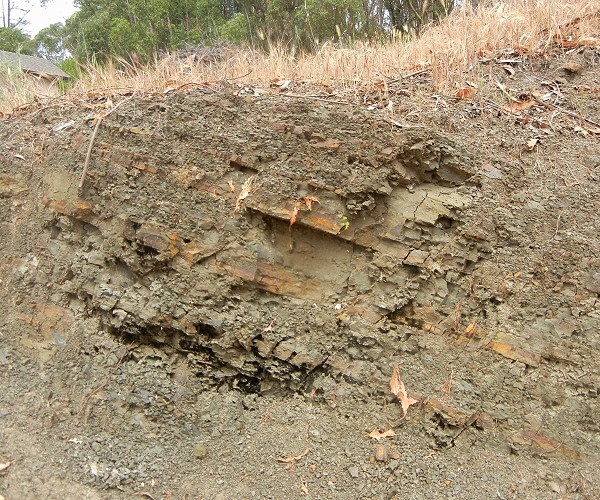 The conglomerate of the Orinda Formation was one. 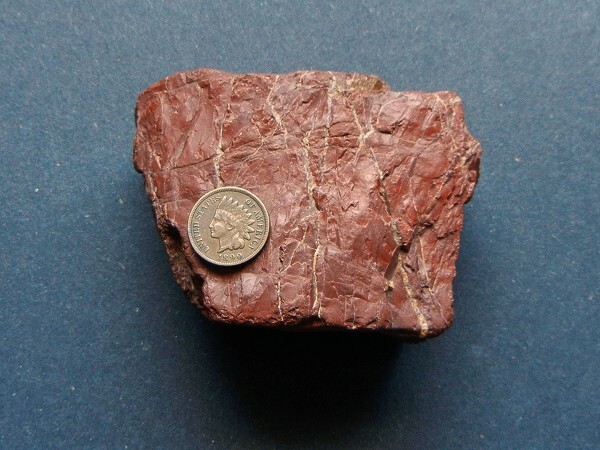 The red chert from the Franciscan Complex was another. And of course there was our serpentinite. All told, I made five sets of 15 rock types for the kids. 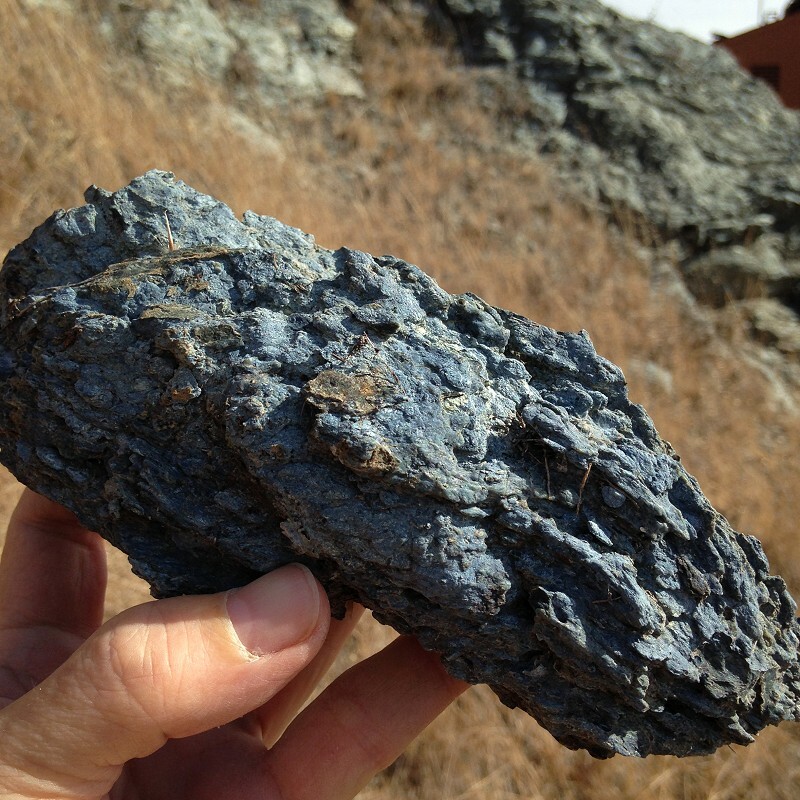 The next year I got a request from Las Positas College, in Livermore, for a boulder of blueschist. Turns out this little college teaches geology, because every citizen will benefit from a course, and students can get a head start on a 4-year degree there. I struggled one out of this streambed, where it wouldn’t be missed. They installed it in their teaching garden as Rock J, on the left. 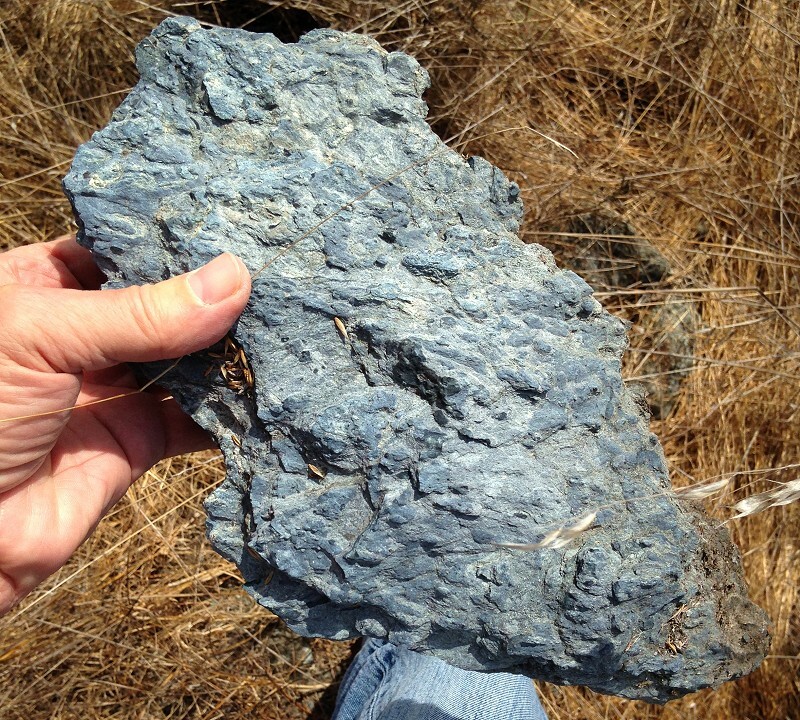 It’s small compared to its mates, but that thing weighs a ton because high-grade blueschist is pretty dense. My reward included a visit backstage to see their cool collections. Then last year, I got a note out of the blue from the under-construction Maine Mineral and Gem Museum asking my help in building their collection. 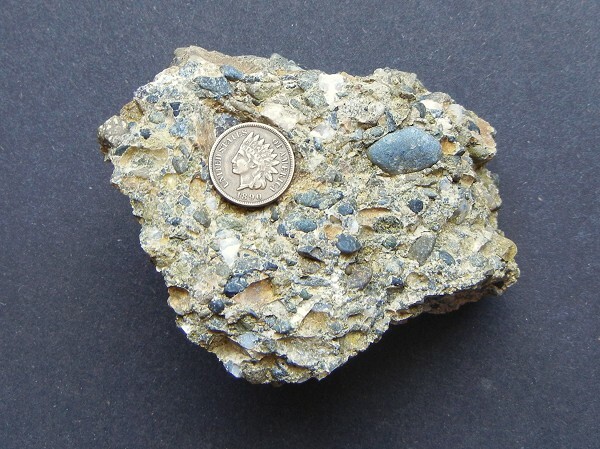 Maine is well known for its gemstone and mineral mines, but the state has no blueschist. 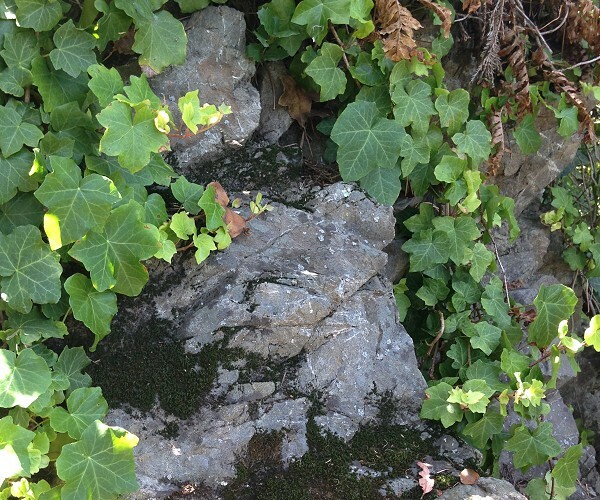 I went to a quiet outcrop where it’s just lying around. Got two nice boulders and couldn’t choose between them, so I sent them both. They told me one will go on display and the other will go in their teaching collection. None of these are precious collectibles or gemstones. They’re just cool and educational. I’ve pretty much stopped collecting rocks for myself because I’m not important enough. But museums are important enough. For a while now I’ve been envisioning geological rambles around Oakland — walks (hikes, really) that aren’t loops, but traverses. They rely on public transit, because that’s mainly how I roll. You can walk them in either direction. My ultimate idea is to work out a network of rambles that will cover the whole town. You could combine them into epic outings. This is the first ramble. It’s a little more than 4 miles. 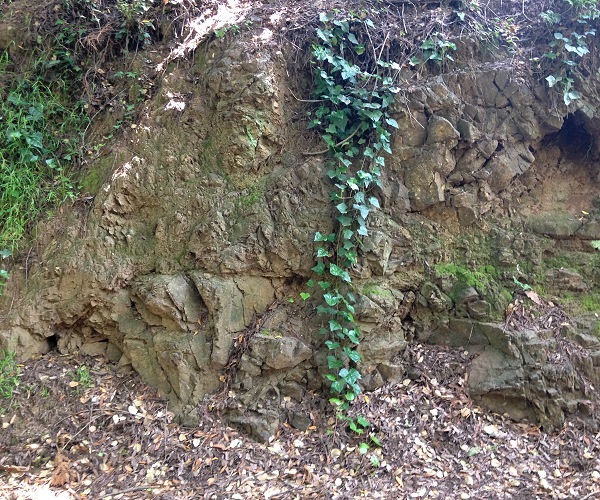 Briefly, the route takes you past Franciscan sandstone of the Piedmont block (Kfn), then crosses the Hayward fault into much older mixed rocks of the Coast Range ophiolite (basalt (Jb), serpentinite (sp), Leona volcanics (Jsv)) and a bit of Late Jurassic mudstone of the Knoxville Formation (KJk). (Search this site for more about all those rocks.) Remember to leave the stone alone. 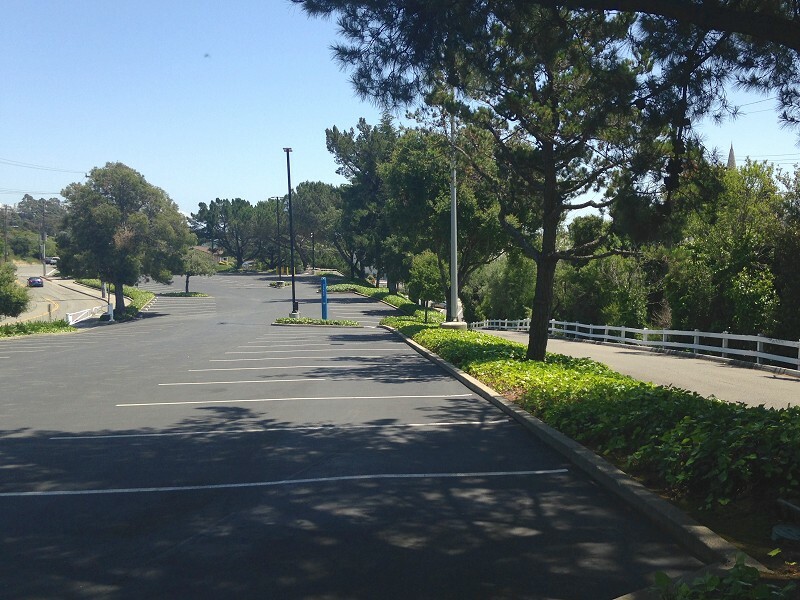 Oakmore Hill looks pretty intimidating as you cross the Leimert Bridge. Part of that is because of Dimond Canyon below. The bridge is about 125 feet above Sausal Creek. Buy your fuel and water in the charming little Oakmore commercial district. Then make your way to Braemar Street along the top of the hill. Take any route you like. The intersection of Arcadia and Melvin, directly above the E in “Oakmore,” is a good shady spot to regroup and refresh. Along the way you’ll see exposures of the sandstone. Braemar Street is nice and level. Truck along right to the end and enter the footpath like you do it all the time. 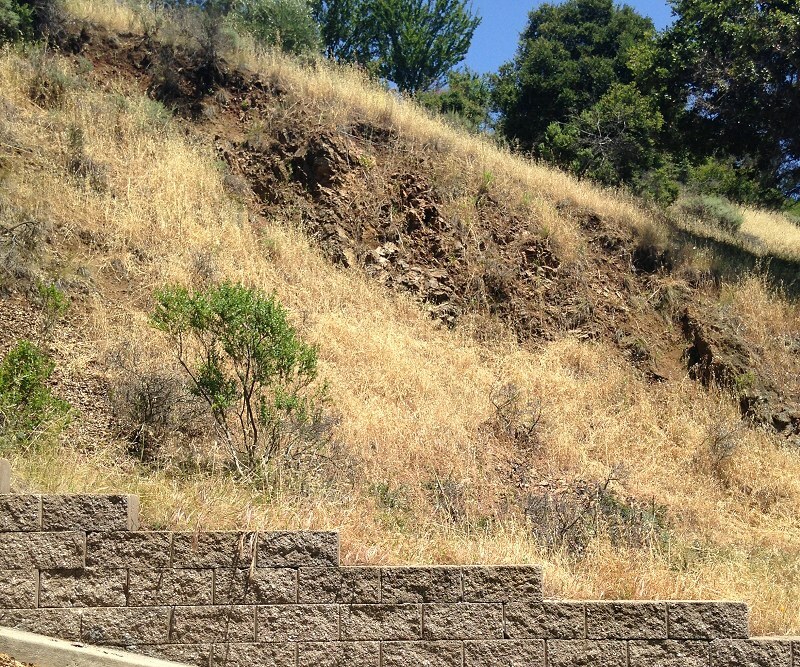 As you descend the steps, look across the fault-line valley to the bare slopes of Joaquin Miller Park. That’s where you’re headed. Closer to hand, you’ll see that the rock has changed. This appears to be the Jurassic basalt, unit Jb. On the way to the freeway overcrossing at Lincoln Avenue, look at the lay of the land. The active trace of the Hayward fault isn’t precisely mapped here, but it runs from about the lower middle edge on the left side to the horizon directly behind the large tree (note the LDS Temple spire on the right edge). The next time the ground breaks, you’ll see it very clearly here. 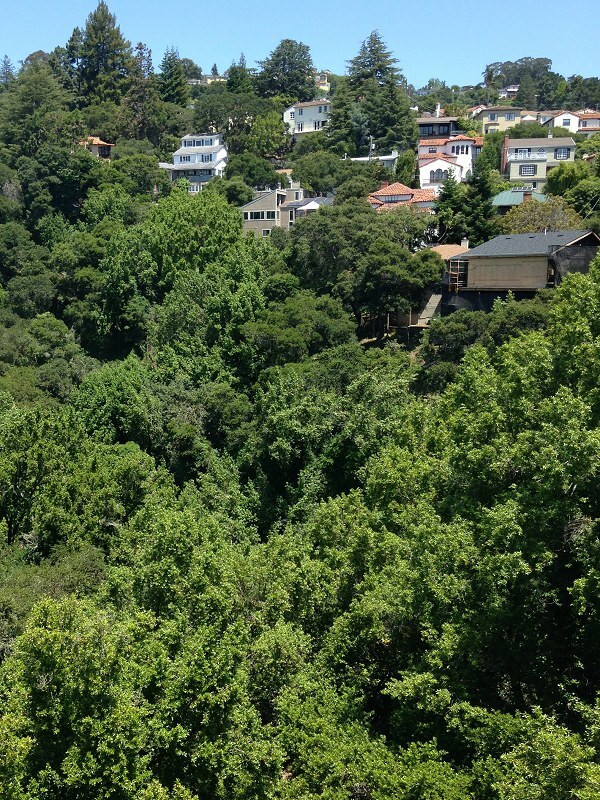 Cross the freeway and take Woodminster Lane to Woodside Glen Court, where the road ends at a backdoor entrance to Joaquin Miller Park at about 700 feet elevation. Things get pretty steep here, and they’ll stay steep. The exposure appears to be either Leona volcanics or Franciscan sandstone; the important thing is that the bedrock changes abruptly as you enter the woods into the area mapped as serpentinite. This is where I show the route forking. It’s easier to go right, either on the trail or on Sanborn Road, going downhill to Joaquin Miller Road and across it to Butters Drive. I took the high route, up what I call Visionary Ridge, because I was returning two pieces of basalt to the locality where I got them. I thought better of that plan as I passed the park’s native plant nursery, where I added them to the little border at the bottom of this photo. The hillsides here are pure serpentinite and worth a close look. The high route continues along the ridge crest, around 1100 feet, to Joaquin Miller Road, where you cross and take Robinson Drive to where it meets Butters Drive at about 1025 feet. The high route will save you a loss and gain of 200 feet, but you’ll miss Butters Drive. 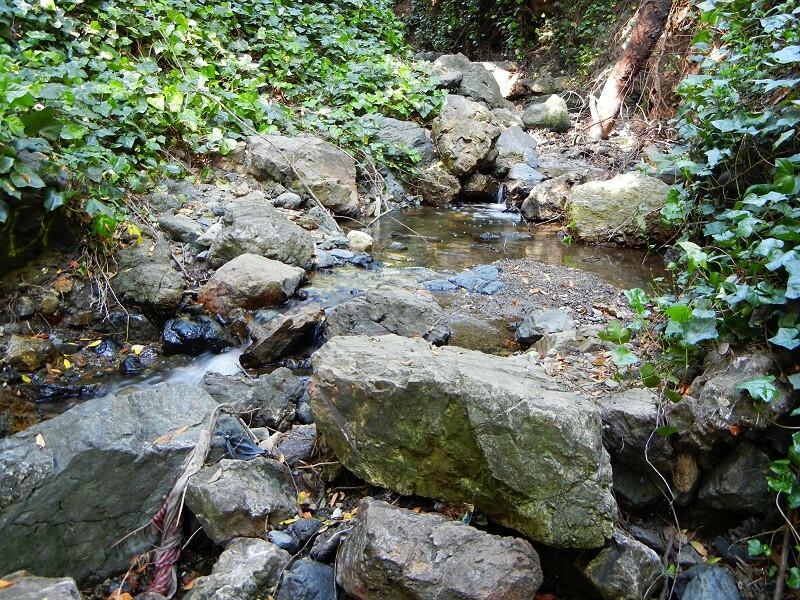 Continue past the hairpin turn into the headwaters of Peralta Creek in the Butters Canyon private preserve. Here the rock along the road is mapped as Leona volcanics. The intriguing thing is that right across the creek the rock is Knoxville Formation, a unit that’s generally shale and hence easily eroded. I think this contact is exploited by the creek to dig the canyon so locally deep. You can get a good look at the Knoxville right above the intersection with Robinson Drive, where the high and low routes meet again. 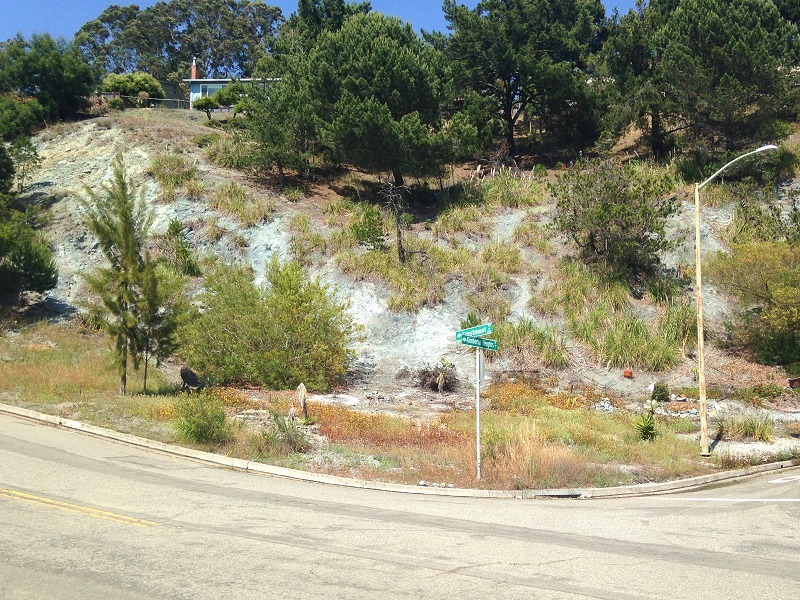 Now the route plunges about 300 feet down Crestmont Drive and through Oakland’s largest area of serpentinite. Take in the prodigious exposure at Crestmont and Kimberlin Heights drives. 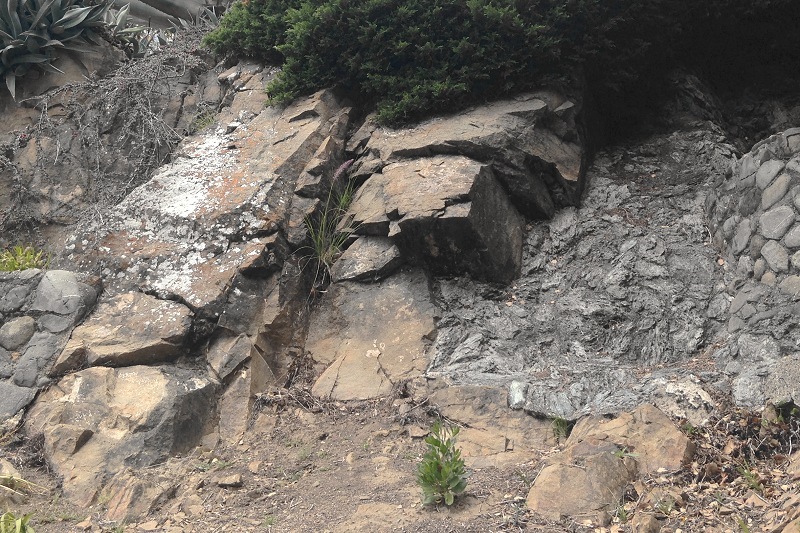 The west edge of the serpentinite zone is a thrust fault, which means the rock here is quite pulverized. This part of the hike has several interesting exposures that I’ll let you discover on your own. The very easternmost end of Crestmont Drive goes through Leona volcanics, which you’ll see in boulders. When you reach Redwood Road, truck on downhill to Campus Drive at about 650 feet elevation, where the 54 bus comes by regularly. It’ll take you to the Fruitvale BART station or connect you to major lines on MacArthur, Foothill or International boulevards.